Once you have the outline planned for each of your six blocks, it is time to flesh out the block with the daily and weekly plans for your children. Take each subject’s goal for that block, and break it into 6 weeks of work. If you want your child to finish three chapters in Math by the end of the block, then plan to finish one chapter every two weeks. In two weeks, we had eight total days of desk work (see the sample planner page below), so I would divide that chapter into ideally three days of teaching concepts, three days of working the problems, a day of margin for review, or extra teaching or practice where needed, and the final day for end of chapter testing. Write out each day’s goal for each child. Before that block begins, do this for every week of the block, so you will have six pages of plans in your binder. This is an example of what a week’s page of plans looked like for me. I used a blank planner page which I could copy as many times as necessary, and filled in the details with pencil. The notes are as important to your weekly plan as the previously-mapped details. You cannot remember what you need to amend for each child while you are in the middle of wrangling your children, their lessons, and real life. Leaving room to jot quick notes and updates will save your sanity. 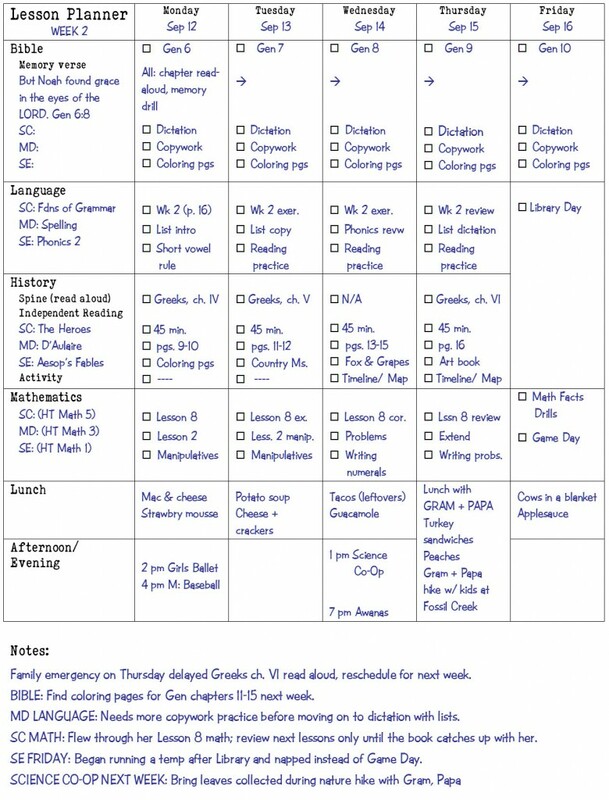 Your week’s plan, once completed, becomes the record of your child’s finished work for the year. You can file it in your child’s record book, or save each week’s plan and make a neat achievement record from it at the year’s end. You might notice that by the time you get to the sixth week of your 1st block, you may be off where you wanted to be at the beginning of your 2nd block, either behind or ahead. Going back to our example, what if, because of real life, a family emergency, or your child struggles with one of the concepts, you only complete two chapters in your Math for the block instead of your planned three? This is actually normal and not a reason to panic! In the week off, correct the record for the block just finished, file it, and adjust the remaining blocks where necessary. Then using your adjusted plan for the next block, fill in the details for its six weeks. We have to remember that whatever goals the grade planners out there establish for 1st grade, or 6th grade, or whatever grade, they are there for the sake of regulating the public school system. In the 1800s in our country, children just went on to the next thing, whatever it was, when they had mastered the current thing they were studying. So there was one spelling book, for example, which covered all the concepts from simplest to hardest in order. In the same one-room schoolhouse, you might have an eight-year-old and an eleven-year-old working from the same page in the spelling book, because each was doing the work right where they were in their learning. In the 1800s literacy was much higher in America than it is today, so they were doing something right! 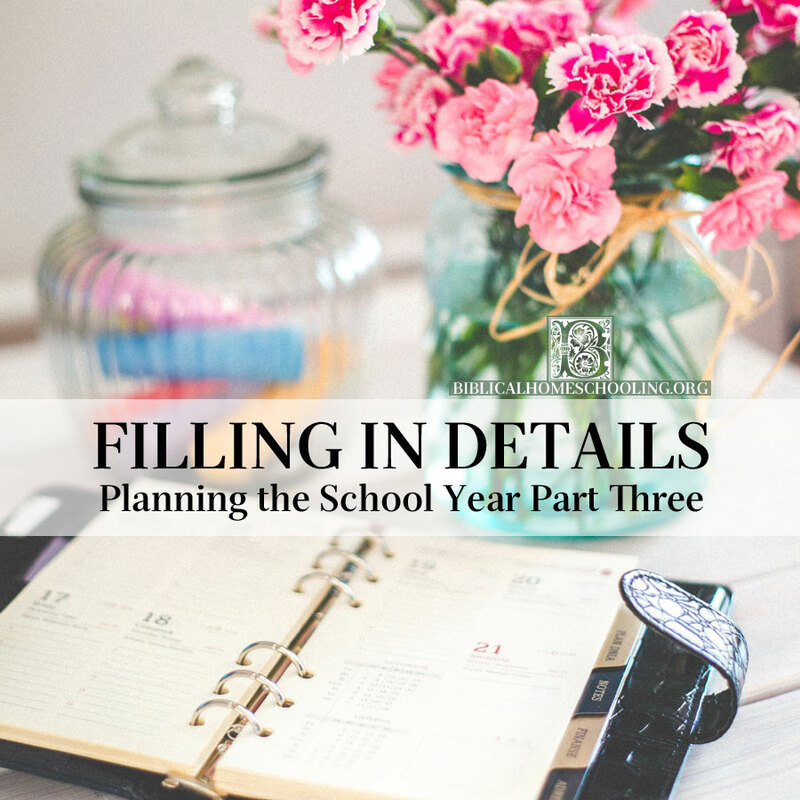 Remember to keep your plan in its proper place as a tool to help you and your children accomplish their goals for the year, and do not allow it to become your taskmaster, squashing the joy of learning for you or them! Have a productive and blessed school year!